This is a guide intended only to give you a general informational overview of the 11 most fundamental things you would need to know before going off the grid. It is a curation of "words-of-wisdom" gathered from the experiences of those who have taken the step of creating their own off-the-grid lifestyle. It is relatively easy to go off the grid by simply cutting your connection to the power grid. But, it is very complicated to go completely off the grid to self-sufficiency. It is also very easy to underestimate what is involved in creating the off the grid self-sufficient lifestyle. Here we explore some of the more significant challenges you may have to confront in going off the grid. These are the basic things to know as you set out to create your own off-the-grid homestead and new lifestyle. Everyone's individual going off the grid situation will involve different circumstances and many will be unique to your particular situation and plans. So this review is intended to cover only the fundamentals that you may have to deal with. It is not intended to cover, and does not cover, every possibility of things that you may need to know or that may go wrong. That's why you are invited to join the "How To Live Off The Grid Now" growing community where you can seek advice and get answers to your own questions. You can also offer your own experiences as feedback to help answer and support other members in the community. When joined together in a common purpose on a common project, we are always stronger and more successful! That's a key benefit you get in joining this Community. Growing your own food is an essential part of becoming self-sufficient. I call that 'farming", or farm-like, for want of a better generic description of doing that. But this is not a traditional form of farming and farming is not the only way to get there. Besides, my suggested way of farming is potentially easier, healthier and overall more rewarding. My idea of going off the grid with a farm-like activity is to grow a broad range of food not only to feed yourself but also as a possible source of income. Even a backyard, or small-scale, farm-like activity could do this for you. You could be doing this on a plot of arable land anywhere in size from 1.5 to 100 acres. Even 1/2 an acre may suffice. More about this below. This goes to my early life experiences of being off the grid on the family farm - shown in the banner above this post, on my current day research about options for living off the grid and on my own objectives in exploring and preparing for how to live off the grid now. That's because my goal - for you and me - is to get to self-sufficiency and self-reliance with freedom from "the system". That includes freedom from dependence on the power grid for electricity, super-markets for food and the 9-5 jobs market for income. It's also just another way to possibly survive in a TEOTWAWKI* situation should that ever happen though this article is not about survivalism. *The End Of The World As We Know It! However, there are other ways to get there. I also firmly believe in entrepreneurship and the pioneering spirit. Creating your own Online Business is another way towards building a self-sufficient life in going off the grid. This option is also covered in "How To Live Off The Grid Now" as a possible solution to getting yourself out of "the system" and into going off the grid. Satellite Internet now helps make this a possibility even when off the grid. So you do not have to go all-in on farming to get yourself off the grid or to join our community. You just have to want to know how to get out of "the system" and into living off the grid. If you are thinking, or planning, to go live off the grid or you are in the process of going off the grid or you are already living off the grid, this is for you. Welcome. But remember, this review is just about the 11 things you need to know about before committing to going off the grid. For this and everything else about "How To Live Off The Grid Now", <= click to register to join this growing community. First, there is the most important thing to know up-front, and keep in mind. This is the famous Murphy's law type of consequences, originally attributed to Robert Burns, the Scottish Poet: "Plans Often Do Not Go As Expected!". So, the first rule of going off the grid is to always remember to "KISS your plans: Keep It Stupid Simple!" The following pages explore the 11 Things You Need To Know in some detail. If you open this post as a PDF, you should find that it is Bookmarked for convenience. The PDF text also seems to me to be easier to read using a browser rather than using Adobe Reader. I hope you find this post interesting, Informative and useful. I Look forward to having comments and feedback from you. See the end of this post for Comments - please scroll on down below "About the Author" to add your own comments. I read them all. - Things take much longer and need more effort than you might imagine! Keep the ages old acronym in mind as you layout your ideas for going off the grid: KISS - Keep It Stupid Simple! That does not mean to suggest that you are stupid; far from it. You would never consider going off the grid if that were true. This is just a way of emphasizing the need for simplicity here. Smart folks know, only too well, that dumbing things down to basics often helps clarify what needs to be done next. It makes life simpler! So don't set yourself up for failure and disappointment from the outset of your going off the grid project. It's way too easy to think you can undertake more than you can realistically accomplish with the time, money and resources that you will have available to complete any phase of your project. It is in our human nature, unfortunately, to way under-estimate what it will take for us to accomplish any major task. I'm equally as guilty as anyone of doing just that, so I know how easy it is to fall into that trap. This is especially so when it comes to thinking about how long, and how much, it will take to build something like a house. There are just so many variables that can, and will, affect the outcome: Weather, available resources, available materials, available man/woman power, permits, inspections, cash-flow, etc..
Start out by writing a story. Describe what you see ahead as the kind of life you will live in going off the grid. Use the classic Who, What, When, How, Where, Why questions to create your story. Who is going to be part of this going off the grid adventure? Why do you want to get off the grid? What do you want to accomplish? What will your new off the grid homestead look like? How do you see yourself in this new lifestyle? When do you want to get off the grid? Where do you want to live off the grid? Is there a problem you think going off the grid will solve? Why, and how, do you think going off the grid is the solution? Keep in mind that a complex idea at the outset may later become an overwhelming project to complete. Remember also that weather, available resources, available materials, available man/woman power, permits, inspections, cash-flow, etc., will affect the outcome of your plans. KISS is the watchword here. For example, just consider what can happen if the weather in your chosen area is subject to frequent or unexpected rain showers: Rain stops play! Or, suppose you have an unexpected snow-storm or wind storm while framing your new home. You could be faced with a very costly impact in time, money and effort to recover. If the weather turns against you, you must be able to react quickly. You must protect your materials and work in progress. Any of these situations can seriously damage construction and materials beyond use. Dangerously unhealthy mold can grow when building in damp conditions. You can easily have mold growing within the damp fabric of your building. You must be sure it is dried out before enclosing and completing it. Another example of potential trouble. Consider what can happen if your plans call for creating an all-encompassing self-sufficient, self-reliant, homestead from the outset. Do you have the necessary funds to support doing that? What about people power? Are there enough people going off the grid with you - family or friends - to help you with construction? How much will it cost to get all of the materials you will need to complete your project? These pieces that are basic needs in support of your project give you every reason to remember to KISS your plans. Perhaps you can plan to start your build within a generally known good-weather window time in the year. Find out when there is a likely-hood of periods of bad and good weather in your chosen location. Then plan to avoid building an open construction phase when bad weather is most unlikely to happen. Include in your plans contingency options. Use these to protect your investment in materials and work-in-progress so as to minimize any consequent set-backs. If you really want to build a complex home or even a complete homestead complex, then break it down into stages. Plan to eat the "Elephant" in small bites at a time! If your plans includes a large area, multi-room, home and outbuildings, then look at the overall construction process to see if you can break it up into sections. Arrange to build sections in easily managed, logical, incremental, stages over time. Do not attempt to build everything in one fell swoop from start to finish. Consider using a Yurt or building a tiny house as your starter home instead of plunging into a complex project. You can always replace or extend later. In this way, you can get off-the grid and onto your new homestead location far quicker and easier. Once you build your basic shelter, you can then build your permanent home and infrastructure over time. In this way, you can complete stages with fewer mistakes and far less pressure and stress. Small steps of successful completion will help build your confidence and give you encouragement. Building in stages, if possible, will also be far less stressful. Staging construction will help you be far less overwhelmed emotionally and mentally. Developing in stages will also be much less demanding in terms of your physical and financial outlay. By doing things in logical stages, you can build with greater care and attention to detail. 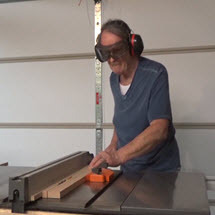 This will allow you to produce a far better, more functional, more reliable, final product. The result will likely need less follow-up; less maintenance, less fixing and less retro-fitting in the long run. A big benefit could be that this will give you more time to enjoy the fruits of your labors and creativity once you've settled into your new home in your off the grid life. Do not create overly-complex development plans and then expect easy completion. Avoid becoming overly ambitious about what you might be able to accomplish. That could end up being very costly in time, money and effort. Be aware of weather patterns in your chosen off the grid location so as to build during good weather. Plan to build in practical, simple, easily-achievable stages: Small wins build confidence. Analyse and budget your available resources before starting: Time, money, people-power, etc..
- To expect is to be disappointed! To hope is NOT a strategy! In fact, many plans never go as expected! This section expands on the KISS theme because it is so important and its benefits often not understood which leads to trouble. but grief an' pain for promised joy"
Which translates quite simply into "Even the best thought-out plans can, and often do, not work out as expected, leaving us with nothing but grief and pain instead of the happiness (and success) that we hoped to get from following our carefully laid out plans." Had I listened to my father or paid attention to what I was taught in High-School about what Burns was really saying, I might never have bothered to learn project management. You do not need to create a full-blown Project Plan but doing a Critical Path Analysis could save you tons of grief and money. Critical Path Analysis is a method of laying out a plan of parts in an integrated, inter-dependency-ordered fashion. More about that below. 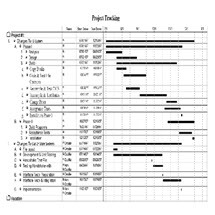 That simply means that you lay out all of the parts that go into completing any stage of your project in the logical time order of completion so that things that need to be done before other things can be started can be identified. This is intended to highlight activities, tasks, objectives and resources where failure to timely complete any early critical stages or parts might impact the successful outcome of any complex undertaking. However, do not to rush out to learn the complexities of project management. Being able to basically plan ahead is all that need be done. But planning is critical to supporting the possibility of a successful outcome to your own going off-the-grid project. You simply need to include options in your plans to allow for handling any possible set-backs that may be encountered along the way in order to minimize their impact on the outcome. So, how do you know where possible setbacks might occur so you can handle them? Well, that's where Critical Path Analysis will help you. For example, think about boiling a kettle of water. Think about the order in which you have to get things done to boil water in that kettle at the most basic level. Turn On Stove - Assumes stove is in working order ready to go. The point of the above exercise is to demonstrate how certain dependent actions cannot be taken until a previous action has been completed. For instance, you cannot do 3 -Fill kettle until you have both 1 - Kettle and 2 - Water. If your goal is to have some boiling water, then you will have to follow all actions in logical step from 1 to 10. Just apply this idea in breaking down what you would need to do to complete any part of your project. From that logical diagram, you will then be able to find which activities may be a problem to complete in time and why. Then you can take action to handle those situations, saving yourself time, money and effort. That's why this report about "11 Things To Know Before Going Off The Grid" was put together. Hope is a costly way to do anything. You really do need to create, and work to, a plan. Burns was allegorically referring to the circumstances of a mouse that builds its nest in the seeming sanctity of a field. It does this out in the field presumably because it seems safe to nest there and it has food there. But then, the nest is destroyed when the farmer comes along to plow that field. But you are not a mouse. Unlike you, a mouse is most likely not capable of evaluating anything going 'agley' (awry) with its home building plan. You can anticipate events such as farmers needing to plow fields but the mouse probably could not. You can never have too much information before actually going off the grid. Get a school binder and/or use software to bring together all of the information you collect in a way that gives you quick access to it. I use Microsoft's OneNote (part of Office365) for gathering info and developing ideas. Gather as much information as you can about all aspects of your project. This includes researching your chosen locality and learning as much as you can about it. Visit your chosen area and spend some time there. What are the weather patterns? Are there local bye-laws or zoning restrictions that would limit what you can do? What kind of neighbors are next door? Would they likely be friendly and supportive or hostile to your planned homestead? Research the type of construction you want to use. Explore the options for supporting your life off-the-grid. Then include strategies in your plan to deal with possible set-backs and emergencies. Consider changing your choice of location, construction and income options to ones that would be less vulnerable in the event that any known area-specific potential disaster event may occur within your chosen area. Learn as much as you can about what it means to live off-the-grid before living off-the-grid. Learn as much as you can about your chosen area for setting up your off-the-grid homestead. Go visit and spend some time in your chosen area to get the feel of the place and to learn all you can about it before committing any investment there. 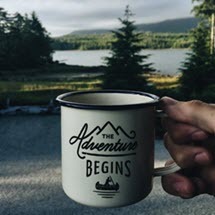 Plan out the process, including steps to take and milestones to achieve, to follow in going from where you are today to where you want to end up before setting out to live off-the-grid. Do a Critical Path Analysis (CPA) of any complex areas of your plan to find any activities that have critical resource dependencies that would affect completion if not available in time and sequence. 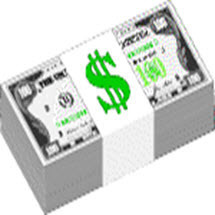 - There's no free lunch here: Creating the off-the-grid lifestyle takes money! Going off the grid to become self-sufficient and self-reliant is costly upfront. It does take money to get off the grid, especially if your goal is to include having any degree of comfort in your new home. There are many areas of activity and creativity that may need to be funded in creating your ideal, self sufficient, homestead. For example, drilling a well or creating a septic system. However, once established, your costs of living should come down quite a lot and your life should be healthier and happier. Overall, the final result could have you feeling that your adventure has been worth every bit of what you have put into creating it. Getting to the point of generating income from any of your planned off the grid activities will take time. It could be a year or several before you can bring in a substantial income. Depends a lot on what you do and how you do it but you are likely to need cash in the bank to support yourself as you develop resources that ultimately could produce income. So it is very important to commit to becoming as completely debt-free as possible before your start creating your going off the grid lifestyle. Even though you, most likely, will be the one doing most of the work in creating your off-the-grid homestead and lifestyle, there will be many expenses that you cannot avoid. Plain and simple, you must have capital, savings or a source of income to get your project up, complete and running. Until your reach the point of producing income from your homesteading operations - be that sales of vegetables, livestock or any other productive activity - you will need cash. Hence, creating a budget and tracking your cash-flow is equally as critical to your success as is planning your project. Tracking your cash-flow can help you to avoid the nasty surprise of running out of money at any critical stage of development. If you don't watch your cash-flow, that could lead to you losing everything in which you've already invested time, money and effort. You need to lay out in your plans just what each stage of your going off the grid homestead construction is likely to cost. Figure out how you are going to pay for each stage. Get an idea of what each stage will cost before you commit. You must do this in order to make sure you will have the necessary cash and reserves to complete each step of your project. In an ideal situation, you will be planning ahead and then getting started on your actual going off the grid development activities while you still have a regular source of income. In other words, figuratively, don't risk jumping from the frying pan into the fire by burning any bridges that might help you retreat if necessary. Make sure that you are not getting into going off the grid before you are really ready. Do you have the money available to support your plans and do you have your plan clearly laid out? Have you created a road-map to follow and have the financial resources to support following that road-map? In the not-so-ideal situation where you do not have a current source of income, you will need a more resourceful strategy to get going off the grid. Perhaps you have been building a load of debt because your job went away. Maybe you have not been able to secure a new position paying as well as your previous employment. I know how that goes and how that feels. Been there, done that: This situation happens way to frequently these days. Another reason that I created "How To Live Off The Grid Now" as a possible solution. You will need to create a new source of income for yourself. 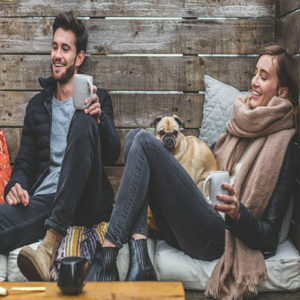 For example, you will need to create your own online business or provide a product or service for which you can get paid and that you can produce or operate from your off-the-grid location - a business that you build and control so that you are no longer dependent on the typical 9-5 jobs market: You are your own boss. A primary goal of going off the grid is to create your own source of income independent of the 9-5 Jobs Market. There are a number of options for doing that. For example, maybe you can create an online business. Perhaps you can produce a product or develop a service. Explore things that you can operate and sell from your off-the-grid homestead. There is a subtle beauty in creating an online business as a source of income*. It is that you are then placing less dependency upon growing food. Growing enough food for yourself will take time. To grow enough produce to sell for income will take much longer and require more effort. Once you have developed a sufficient level of reliable cash-inflow, you can then use this cash-source to not only support your going off-the-grid plan but also to help sustain yourself once you have established your off-the-grid homestead infrastructure and lifestyle. Going off the grid, creating the homestead and new lifestyle takes money. Being debt-free can mean the difference between succeeding in your new venture or failing in bankruptcy. Creating your own online business may be an option for creating a source of income instead of relying upon farming or gardening produce*. *Disclaimer: There is no guarantee that your online business activities will reliably create enough income to support you or your off-the-grid lifestyle plans. - Creating the off-the-grid lifestyle is both time-consuming and takes hard work! Going off the grid takes a great deal of time and effort. Many things just cannot be done in a hurry. It will, most likely, take you far longer to achieve the results than you expect, or even plan, to complete and you absolutely must have a broad range of good DIY skills. Bear in mind that living off-the-grid is a totally different style of living compared to living in a grid-connected conventional home in a typical urban/suburban setting with all modern conveniences and services directly supplied or readily accessible from your doorstep. Many things that you have taken for granted while living in suburbia will not be available. Some of the things that you will find that you now need will also need your full attention just to get them. It can be quite a shock to your system; a wake-up call as the realization of how different life is off-the-grid finally dawns on you! For example, if your chosen location does not come with a house already on the site, you are going to have to have some form of shelter. You will have to build or buy something in which to live. if you are going to depend upon whatever you can grow to feed yourself and your family, that process alone can take several months of good growing season just to produce your first batch of edible crops. Overall, it could be at least a few years to get to the point where you can reliably be self-sufficient in your own food production. You need to know what you will do for food in the meantime while getting things into production. Any food production timeline also assumes that the weather cooperates with your growing plans. It takes a lot of work to create that vegetable garden in the first place, even if you have the necessary tools, labor (people-power) and good weather to help you. If you intend to produce enough food to also market your produce, the effort and time involved could easily become as much as any conventional full-time job, and even longer and more demanding than that. On the other hand, just having the independence of being in charge of your own activities and production typically will also be far more satisfying and enjoyable work than anything you are likely to do in a normal 9-5 employment situation. Are you going to include any kind of chickens as a food source and as a possible income-generating, marketable produce source? This also takes time and effort to set up and the results can also be seriously impacted by the prevailing weather conditions. On the one hand, chickens, just for a source of eggs, could be established relatively quickly. You can do this by building a simple chicken house and stocking it with hens already laying eggs. Don't forget to provide them with appropriate feed, grit and water even if they have access to free-range on pasture. However, egg-laying chickens typically do not make for the best eatable meat chickens. Nonetheless, if you are prepared to sacrifice an unproductive layer-chicken, you could have one available for your crock-pot stew from this first batch of chickens relatively quickly. On the other hand, to set-up even a simple broiler chicken operation for marketing production could take at least 8 to 12 weeks from start to first sale. That is assuming that you have your brooder facilities and chicken tractors already built and ready to use. Do you have buyers lined up for your broilers. It also assumes that everything goes according to plan. That is probably most unlikely to happen from the outset, as previously mentioned above. Do not assume anything; hope is not a strategy! To sell a broiler chicken also takes time and effort in the final processing of the chicken for market. Are you going to be up for that? It also takes time and effort to create a market and build a reliable customer base. Competition in your area may be quite fierce or there may even be no interest amongst your local neighborhood for your pastured broiler chickens. All livestock will require their own facilities. Whatever animals you add, they will all need their own space and land. They will require your time, money and effort to maintain them. This can result in taking valuable resources away from other parts of your project and that could delay, or interfere with, completion. On the other hand, adding livestock could bring you closer to self-sufficiency. Adding a rotation of pasture raised beef cattle followed by pastured chickens could ultimately be quite profitable. It will certainly result in excellent meat for your table and for market. You could also breed rabbits for meat and market. They are fairly easy to handle. Pigs could also be a welcome addition. Pigs free-ranging behind cows and chickens serves to naturally till the soil. This method retains and spreads the nutrients without using machinery. It also helps to build better quality, naturally productive, soil without using man made fertilizer. Using a pasture rotation method of growing your livestock has the benefit of reducing, even eliminating, dangerous pathogens. That means naturally healthier livestock. This also naturally eliminates the need for herbicides and antibiotics. But all of the above just outlines some aspects of your off-the-grid food production activity that you need to take into account in your overall plan. What about your home construction activities that are essential in the process of creating your self-sufficient, self-sustainable, off-the-grid lifestyle? Where does the home construction fit into your scheme for successfully going off the grid? What type of construction do you plan to use? Some require more intensive and complicated activity than others. Some types of construction can take much longer than others. More about your going off the grid shelter/home construction is coming up in section "10: A Yurt Can Be A Good Temporary, Even Permanent, Home" below. Aside from constructing your actual home, if one does not already exist on your property, you will also have to invest in a source of potable (safely-drinkable) water. This may require either a connection to a municipal water supply or the construction of a well with pump and water-purification equipment. You may have to hire a contractor to complete this process for you. In addition, it is likely that you will want to include an effective filtration system against bacteria and any toxins and you may want to include a water softening process if your well water is extremely hard - full of calcium and other salts. Few things in life contribute more to creating dangerously unsafe, unhealthy living conditions than lack of proper disposal of human waste. Lack of proper sanitation will quickly lead to disease, and even death, in so many ways. If your chosen location is far from any local municipality sewage services, you will have to construct a septic system to handle the sewage output from your new home. Construction of a septic system takes careful planning to ensure that sewage does not contaminate your water source and, most likely, will also require permits and final inspection sign-off before it can be used. Even setting up an Outhouse requires careful planning to ensure safe disposal of waste without contamination of your water and food sources. You can now get Composting and Incinerating Toilets in several versions. One of this type of toilet might be a very good option. The right model could reduce, or even eliminate, the need for a large septic system. More about Sanitation is coming up in section "8: Sanitation - Composting Toilet Solves Septic System Problem" below. What are you going to do for electricity? Are your going to be able to go completely off-the-grid by installing your own Solar system, perhaps along with, or otherwise, using a Wind and/or Water driven Turbine or are you going to still connect to the regular Power Grid? See more about this in Section 6: Electricity - Solar Needs Sunlight; Turbines Need Wind or Water below. Bear in mind also that, in certain areas of the country such as Florida for example, you may not even have an option to be completely off-the-grid because of local or State laws against being completely disconnected from the grid. Decide on the type of homestead you want to construct. Decide on how you are going to support your off-the-grid lifestyle. Decide on how you are going get, and handle, your water supply. Decide on how you are going handle your waste and sewage. - Going off the grid without community support is challenging and lonely! Are you a hermit or a social being? Human Beings are, for the most part, naturally gregarious, social creatures. Few of us really relish being total hermits for any length of time, entirely cut off from all human interaction. While some us do want to minimize everyday interaction with others, most of us still do want, and generally do need, to feel that we can reach out to others when necessary so as to not feel that we are completely alone and without support in the world. This is where "How To Live Off The Grid Now" comes to your rescue! Together we are stronger. In general, we all do so much better in whatever we attempt to do when we can easily associate with, and relate to, others of similar mind, interests and objectives. Together, with a shared common purpose or adventure in mind, we are typically stronger and more successful. Most often people automatically become part of a natural community; their own neighborhood. By physically growing up and going to school together within a community, children make friends, play together and support each other. Meanwhile, parents get to connect with each other through their children, through the school and neighborhood activities and form their own friendships and mutual support groups. However, until relatively recently, if you went to live off the grid somewhere, there was a very good chance that you would become rather isolated. It would not be so easy to connect with others and make friends without making a real effort. But with the advent of the Internet and satellite services, we can now connect with others almost anywhere on the planet. So the internet now enables you to easily still be a part of a community resource. This means that you can readily tap into a support base whenever you need to. You can now have access to informational, mental, emotional and moral support and encouragement of your own living off-the-grid project activity. That's what being a member of the "How To Live Off The Grid Now" community is all about. Going off-the-grid alone can be a daunting experience. Being part of a like-minded community provides mutual support of your projects. Community membership provides a resource for information and answers to questions. Take back control over your own life! Let us "Make America Great Again" for ourselves and solve our own challenges. Register now to join the "off the grid", interactive Community of "How To Live Off The Grid Now". Click here to register. No credit card required to register and no obligation attached. Get a Free Bonus Download when you register. - Generating your own electricity is easy if you have the right energy sources! It has never been easier, nor as cost effective, as it is now to create your own source of electricity. Rapid technological developments in recent years give us several options. We can now reliably replace the typical household connection to the national power grid with our own power-generation system. It's not even particularly difficult to do as a DIY project. 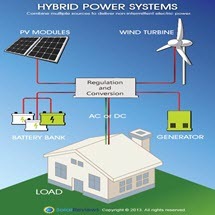 However, a critically key component of a dependable off-the-grid power source is a dependable source of primary energy. You must have dependable Sunlight, Wind or Flowing Water. A Solar system requires a reliable daily supply of sunlight hitting your solar panels in your homestead location. No sunlight equals no electricity generation. Hence there is no electricity generation at night. Likewise, there is no, or poor, generation under constantly cloudy, overcast, low-light conditions. The sun has to dependably shine in your location and on your Solar panels. You must also locate your Solar Panels where trees and buildings will not shade them as the sun crosses the sky each day. If you decide to use a Wind Turbine for your electricity generation system then, obviously, you must be located in an area that has sufficient daily periods of unobstructed, consistently steady and reliable flow of wind with enough strength in it to turn your turbine under load - meaning, when the turbine is delivering electricity on demand. Likewise, if you decide to use a Water Turbine, then you must have a steady, reliable flow of water with enough energy to turn your turbine under load. However you generate electricity you will need special purpose batteries to store the electricity until needed later. These batteries are designed specifically to store, and then deliver, your off-the-grid generated electricity. They are deep-cycle batteries like those used in golf-carts, fork-lifts or boats. They are not your typical car starter-batteries. Energy diversity means that you have more than one way to generate and meet your electricity needs. If possible, use more than one option to generate your electricity. Don't put all your eggs into one source of generation; create a backup source. When you set up more than one system, you are effectively creating a mutually supportive backup system. For times when one source is not fully available, then there could be at least one other source still functioning. In this way, you may have a better chance of keeping your batteries charged and available to meet your demands without having to use a generator as a backup. If you locate in an area that has all three sources of primary energy available on a consistent basis, then you could install all three forms of electricity generation. By using Solar, Wind and Water options together, your demand for electricity can be shared across all three systems. You would then possibly have continued electricity generation even when any one or two of the three source systems is not able to perform at peak production but at least one of them is still functioning fully. For example, on days with overcast, reduced sunlight, skies, possibly the wind and/or the water turbines will be still fully functioning. In this way, you'll possibly still have electricity even on poor sunlight days from the wind or water source instead of from the sun. Going off the grid electricity generation needs a reliable primary source of energy: Sun, Wind, Water. Batteries take longer to recharge than they do to discharge. Diversifying electricity generation methods by choosing more than one type of system can help cover generation on those days when any one primary source of energy may not be available. - Generating your own bio-gas is easy and eco-friendly - saves burning wood! According to HomeBiogas, 1 kilogram of food waste can produce an average of about 200 liters of gas. That's 7 cubic feet of gas that can fuel an hour's worth of cooking over a high flame. Going off the grid can quickly become a very hungry activity. You will be preparing the ground, building the buildings and doing all of the other related activities, So you will be using a great deal of physical as well as emotional and mental energy. That all needs to be properly replenished so regularly eating well is an essential part of any such project undertaking. A wood-burning cook stove is the typical, easy solution to handling off-the-grid cooking. This method gets around the problem of needing a regular supply of propane. However, to use a wood-burning cook stove, you must have access to a plentiful supply of wood that is suitable for use in a stove and live where there are no laws against using wood burning fires. If you have access to a regular supply of propane, then you can easily setup a propane stove. You can also use a propane burning barbecue stove. Even a charcoal burning barbecue stove may work in the short-term. Using a Solar-Stove for cooking should be an option for use once your homestead construction is complete. It may not be a very practical to depend upon for any daily meals. Obviously, it will not work in any area that does not get a reliable daily dose of good sunlight. Perhaps it's obvious that the one non-solution would be to use an electric stove. The demands of a typical electric stove would require a substantial off-the-grid power generation system just for that. So, at least in the initial stages of your project, that would be the least practical and least affordable option. Which brings us to the one solution that is perfect for any off-the-grid cooking situation: Cooking using Bio-gas. You can easily make your own Bio-gas from organic materials and it is an essentially eco-friendly solution. Bio-gas is typically a mixture of Methane and Carbon Dioxide in which the methane is the source of heat energy and the carbon dioxide is a secondary, incidental, inert byproduct of the bio-gas generation process. A typical composting process takes organic materials. This comes mostly from the garden but can also include certain household food waste. Composting will produce methane gas that is typically just given off naturally and directly into the surrounding air. In other words, it is wasted. However, both methane and carbon dioxide contribute directly towards the global-warming problem. Clearly, we don't want to add to that problem that we all are now facing. It also takes a relatively long time to generate any significant amount of gas from a compost heap and is very difficult to capture and contain. Today, Bio-gas generation systems use the same fundamental bio-degradation processes as a compost heap but contain the gases. The process is handled in an enclosed-system so that the gas is easily captured. Now contained, it can be distributed to cooking devices such as a stove-top burner or even a barbecue grill. Bio-gas generation also uses active bacteria in the composting process. This is a bit like using yeast to make bread. In the case of Bio-gas, you can use animal waste for your source of active bio-gas bacteria. This waste is the naturally produced manure you get from keeping cows, pigs or horses. Organic liquid fertilizer is also produced in addition to the gases from this process. Hence your organic waste from your vegetable garden gets recycled into fertilizer for that garden. You can also use your organic household waste produced from preparing, cooking and eating food. In this way you can make fullest use of all homestead organic waste and eliminate the need for commercial fertilizer. Bio-gas can be used for cooking. 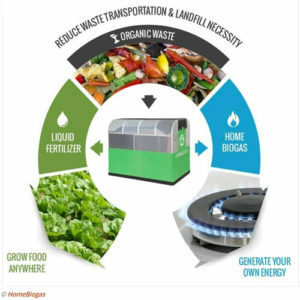 It does take time for the initial bio-gas generation process to get started but then can be easily kept going if you have enough organic waste. Bio-gas generation from organic waste can also produce liquid organic fertilizer. - A composting toilet eliminates the need to build a complex septic system! Everyone has to go to the bathroom sooner or later; even dogs, cats, pigs, rabbits, sheep, cows and horses do! Living and working in any typical urban/suburban home and work situation in North America, most of us don't think twice about using the conventional commode. The typical flushing toilet is found in literally every place that humans have activity. But, in going off the grid, you are faced with having to setup your own toilet facilities. This can become a challenging project especially if you have to build your own septic system or outhouse. A key factor in how you actually dispose of human waste lies in the absolute, no choices here, need to avoid any possibility of contamination of ground water. There is extreme danger to health from the indiscriminate disposal of human waste. In most cases, you will need to get permits before creating a septic system and your system will, most likely, have to pass inspection before you can use it. Even using an Outhouse - essentially a covered hole in the ground - may require you to get a permit. This may require that your land is inspected to ensure that your Outhouse is located where it will not lead to groundwater contamination. Otherwise, you may have to use a waste containment system in your Outhouse to ensure it will not leak excremental material into the ground. That also means your Outhouse will need the waste to be carefully emptied from time to time. You can avoid all of this hassle. Simply choose to use one of the latest technology Composting or Incinerating Toilets in your bathroom. No stink, no mess, very little fuss! They are very efficient and effective in converting human excrement even into garden-usable fertilizer. Given time - depending upon ambient temperature within the conversion chamber - this happens without causing any odorous problems. Composting Toilets are also comparatively easy to install and maintain. So you can avoid the need for a septic system to handle your toilet production but what about water from the sink or washing machine? Typically, all sources of waste water in a house, other than water that goes through a garbage disposal outlet or through a toilet, is regarded as "Gray Water". The good news here is that your gray water can be diverted away from a septic system and recycled through an appropriate gray water handling system so that it can be used to water plants. Handling gray water separately relieves your septic system - if you have one - of any added waste water handling burden. This includes relieving the related negative impact of gray water on the septic system's internal bacterial activity. It also means that you would need a smaller septic system than if all waste water was to be handled by that same system. Household cleaning products become contaminants in your gray water and they will kill septic system bacteria. Without gray water separation, your typical soap and general household cleaning products would naturally end up in your septic system. That damage will reduce the effectiveness of your septic system and it will then need frequent extra maintenance to fix. Modern composting and incinerating toilets are clean, efficient, odorless and easy to install. A composting or incinerating toilet replaces the need for a complex septic system. 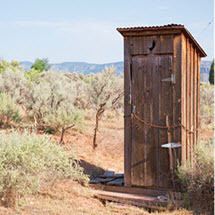 A composting or incinerating toilet replaces the need for an outhouse. Gray Water separation relieves burden on Septic System and provides much needed water recycling for plant irrigation. - Pick your location carefully to ensure it can support your food growing plans! 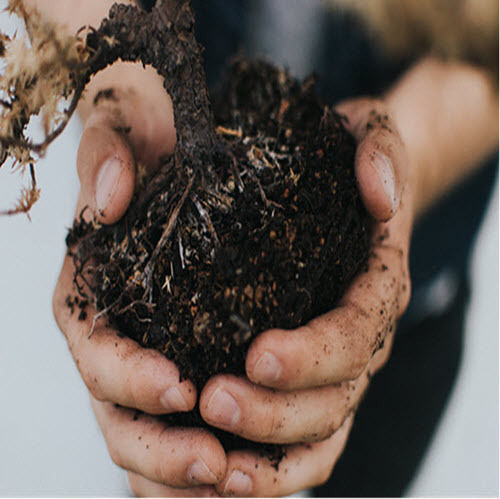 In many cases, soil quality can be improved, often even naturally over time and without resorting to using nasty chemicals. Whether you use chemicals or go all out organic from the outset, the relative cost to amend the soil - in time, money and effort - may make a particular location completely unsuitable. If it is not good soil for growing things (arable soil) in the first place, it may not efficiently support your off-the-grid lifestyle plans. You may need to choose another location for your homestead. But you also must have a reliable source of water for drinking and irrigation. Whatever the source, it must be dependable and it must be made safely drinkable. There are several possible ways to get water. This can be through natural rainfall or from a natural spring, creek, stream or well. You will need to include appropriate filters and may need to use a pump; preferably an electric one. Include water storage tanks for your household needs and create ponds for livestock needs. Water is very heavy for you to have to carry in quantities needed for domestic use. Distribute it directly from your source or from storage tanks using plastic piping using gravity where possible. Filters and softeners may be required even if your water is from a public utility service line. Having a ready, reliable supply of clean, chemically-free, pollutant-free, bacteria-free water for irrigation, livestock and human consumption is essential. You must have access to such a water supply either via a well or via rights to take water from a spring, creek or river. Ideally, you also want the rights to catch run-off rain-water in barrels and irrigation ponds. That is something that is illegal to do in Oregon and certain other areas. Life - your own, your plants' and your animals' - cannot exist without access to clean water! Next to having a reliable supply of water on your homestead is having good quality, arable soil. You need this to grow your own vegetables and to grow your own livestock. Rotating livestock to produce marketable food will also improve soil quality. If you have the capital to support this method, it could reward you in several ways. You mix up growing chickens with beef cattle to grow food for yourself and for market. This method can gradually turn even a basic rough, even poor, grassy area into productive pasture area. For example, you first run a herd of growing beef cattle on controlled-access pasture followed by moving broiler chickens across the same pasture using chicken-tractors. By rotating livestock across pasture, you can produce very tasty chicken and beef and can organically improve soil quality. Cattle manure is grubbed out by the chickens scratching through it for bugs. This helps spread clean, pathogen free, manure over and into the pasture. It will take time and patience but is well worth doing for the results. On the other hand, for a less ambitious, more back-yard style farm, just grow chickens. By keeping chickens within chicken-tractors, you can create the effect of having free range, pastured chickens. You move the tractors around in a planned pattern over all of the pasture area that you want to improve. The chickens will scratch their way through each new patch of earth. They will be looking for grubs and insects and will fertilize the soil as they go. At the same time, they will need less additional feed than normally penned chickens. This method will also produce very tasty eggs from layers and delicious meat from broilers. Adding a rotation of pigs behind the chickens will also help improve the quality of the soil over time. In the ideal situation, you will farm organically. Rotating different species - beef followed by chickens - across the same pasture helps kill potential pathogens. With the pathogens gone, your animals will not need medication. Another big plus will be that your animals will do all of the soil fertilization for you. Then you also will not need, or use, any commercial fertilizers, herbicides or insecticides. Healthy food produces healthy people. Choose your going off the grid location carefully. Look for good, arable, soil quality and dependable rainfall or source of quality water. Make sure that you own the water-rights on your land. 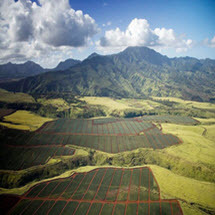 Consider whether to use Permaculture, Aquaculture or a no-till process for growing your food. Consider rotating livestock across segmented pasture to enhance soil quality. This also helps remove the need for commercial soil additions. Avoids the use of inorganic fertilizers, herbicides, biological products and medications. - A DIY Yurt could be a great way to get an immediate, cheap, sturdy, house on-site! Modern Yurts have come a very long way from the traditional homes of the nomads. However, the concept is still the same. Wandering with their herds throughout Central Asia for the past several thousand years, nomads needed sturdy, portable housing. A Yurt fits that bill. A modern Yurt is a round house that uses a collapsible framework supporting structure covered with a weather resistant fabric. Properly designed and constructed, they will weather the worst of storms and weather equally as well, if not sometimes better, than any other form of construction. They are an easy DIY project to assemble. Using modern technology materials in the wall and roof skin materials helps ensure good insulation against heat and cold. A reversible, thermostatically controlled, fan can be put into the apex of the Yurt roof. This will help circulate air throughout the dwelling to help keep the internal temperature even across all zones. The biggest complaint may be the occasional noise of rain on the roof in a really heavy downpour. But the noise level is very dependent on the nature of the roof-skin fabric and internal insulation. Yet even that noise, for some people, may seem like nothing more than music to the soul. To them, it represents the wonderful close connection to nature that living in a yurt provides. Now, imagine being able to get a nominally 700 Square Foot home for around $11K to $15K? Then imagine being able to move in to it within a matter of days from the day of its component parts delivery to your homestead location. That's a 30 foot diameter home ready to be erected, have features installed and be ready to occupy all within days of delivery to your site. Admittedly, that's just the basic framing, wall-skin, roofing fabric and skeleton materials of your new home in that estimate. With such a small bite out of your budget for an easy constructor-kit type home, that's a good deal. It's a well-proven, sturdy, starter home - or even as a permanent home. It can be made so as to blend in with the background of your location. At these prices, you should have plenty left in your budget to fit it out. You can tailor features to your own design. Add in a kitchen, bedroom, bathroom and sitting room to complete your home. You could even get more than one yurt and connect them to each other to add additional space and rooms. This estimate does not include delivery charges from the manufacturer to your site. It also does not include costs of a foundation or erection of the Yurt itself from the kit after delivery. If you have good DIY skills and can rope in some handy friends to help, you can build it yourself. That will save more money and give you the great satisfaction of building your very own off-the-grid home. While a Yurt could be a winning way to get started in going off the grid, there are other options. A Yurt comes with relatively minimal effort, fuss and cost but so could a Tiny-House. A number of Tiny-House builders have popped up recently and many are very creative but still relatively inexpensive. You'll probably invest somewhere between $70K to $165K to have your Tiny-House built for you. Possibly less if you can build it yourself. It's an option really worth considering at least as an initial starter home if not also as a permanent home. You could even build one yourself from plans if you have good DIY skills. If you are serious about going off the grid, you'd better have those good DIY skills anyway! Of course, the classic off the grid home is a log cabin. If you have plenty of the right trees on your chosen homestead site, you could even build your own cabin. Harvesting and preparing the trees and doing the construction will also take time; not something that you can hurry! That could be a very physically demanding thing to do but it will give you tremendous satisfaction when complete. Other off the grid housing construction options include strawbale, hempcrete and cob, all using natural materials. A Yurt could make a great, inexpensive, temporary home to get you started in living off-the-grid. Do not locate your Yurt close to, or under, trees: Avoid having to clear leaves in fall and limit fire risks. 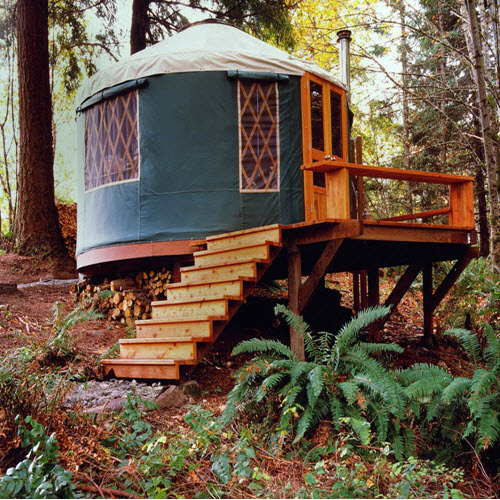 Certain types of Yurt materials and construction could lead to being too hot in the summer and too cold in the winter. A Tiny-House is also a possibly great option as a starter home or even a permanent off the grid home. Some people will keep their Yurt or Tiny-House as a guest-house for visitors after building their permanent home. - Few things can make life feel more miserable than being endlessly cold! If you've never had to live without hot water for bathing, showering or washing up, you are very lucky. You cannot imagine how miserable life can quickly become without heat and hot water in cold weather. If you've never had to live without heat to keep you warm in a cold climate, then you most likely can have no idea of how you will handle living off the grid in any form of home that does not have a way to keep you comfortably warm and provide you with hot water on demand. Keeping yourself warm in the cold weather is equally as important as having shelter from the weather. After shelter, water, food and sanitation, probably the most important thing you will want to help you survive off-the-grid will be some method to stay warm as well as to also be able to bathe without freezing your buns off! So what are you going to do to solve the heating problem? Depending on the type of house layout, a strategically placed wood burning fireplace could heat a room or even a whole house. Typically, it will not also heat your water unless it is one that has been adapted to include that capability as an additional feature. You will need to include an expansion tank in your hot-water system if you use any kind of stove as a source of heating your water. A wood burning stove in your kitchen can provide you not only with heat for your kitchen and surrounding area and give you heat for a Hot-Plate and Oven to cook your food but you can get models that will also heat your water. With this kind of hot-water source, you could also add hot-water fed radiators around your house to spread heat throughout your home. A central/common wood burning furnace that will efficiently provide you with a powerful source of hot water that can be used not only to heat all of your domestic water needs - bathing, showering, washing-up, etc., - but also be used to heat your home using hot-water radiators strategically placed around the house and also provide in-floor radiant heating. A Geothermal heating system can also provide a good source of energy to heat water and your home. Relying upon a natural heat-exchange process, extracting heat from underground at a depth where the earth's temperature is pretty consistent year-round, this kind of system is typically used to heat water as the primary form of heat-transfer medium which is then used to heat your domestic and home heating needs just as in "c" above. A Solar water heating system can also provide a good source of energy if you live in an area where the sun reliably shines year-round. Solar heating can also be used to warm air that can then be force-air distributed around your home. Using propane to heat your water in any quantity larger than that typically needed for soups, cups of tea/coffee or boiling eggs, etc., such as would be required to fill a bath or take a shower, can be quite slow and very expensive. It would consume quite large quantities of gas in the process if you have to do that by heating multiple buckets of water at a time or you do that by installing burners under your bath-tub. The alternative is for you to use a conventional domestic water-heater, or instant water-heater, that is designed to run on propane. 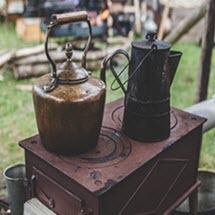 Using Oil to fire a water heater or water boiler could also be an option but you may want to avoid the need for depending on any fossil fuels - including coal - that you would have to have delivered to your homestead. Same limitation applies to using local Kerosene heaters. Granted, you may have to have wood delivered if you do not have access to enough trees on your property to meet your needs. However, typically, wood is much easier and much cheaper to obtain. Also, wood - unlike any fossil fuels - is also a renewable commodity. Modern wood-burning devices are now so much more efficient than they were in days of yore. Hence wood becomes a much better choice to use than would be to use any fossil fuel for your off-the-grid heating needs. The down-side to using any method that relies upon first heating water (or air) to then secondly distribute that heat around your home to keep you warm is that this form of heat transfer typically requires a source of electricity to run the pumps and manage the heating controls. On the other hand, using a strategically placed wood burning fireplace and/or stove in your house could potentially provide enough heat to your home and heat for your domestic hot-water needs that would not require any electric pumps or fans. Being "cold" in your home for any length of time is a misery making experience. Modern wood-burning fireplaces and stoves are very efficient, easy to install and use. Modern technology based systems such as Solar, Geothermal and water-born heating radiator systems require electricity to function. Having efficient thermal-insulation built into the fabric of your home, and orienting your house on your homestead site so as to take greatest advantage of your location to use available sunshine to balance the heating/cooling needs throughout the day and year, can save you a great deal of money and "fuel" over time. We are always stronger and more successful when we are joined together in a common purpose on a common project. As you have seen from reading this review of the "11 Things To Know Before Going Off The Grid", getting yourself off the grid and creating the self-sufficient lifestyle is a complicated, challenging project. I am not claiming to know all there is to know about doing that. However, I am a firm believer in team work and the idea of "stronger together". I know I can learn from you and your own experiences equally as well as you may learn from mine. And I do love to learn more; to discover new ideas and new ways of doing things. So, let me ask you, has this review been helpful for you? What would you have like to have more information about? Do you disagree with anything here? Are you reading this because you are thinking about going off the grid? Or are you already living off the grid and looking for additional help and support or perhaps you are just curious to see if there is anything new here? Are you interested in helping others who are looking to live off the grid or who are already living off the grid? Please help me to help you! I want to know about these things so that I can be of greater help to you. I read all the comments. If you are reading this review in the Free PDF Download, please go to the related post in my Blog and scroll down to leave a comment to give me your feedback. If you are reading this review in my actual Blog Post, then please just scroll down below "About the Author" and "Related Posts" to leave a comment and tell me what you think. Please give me some feedback.